1. Place the scallions, onions, garlic and peppers into a food processor with a pinch of salt, and pulse to mince. 3. Slide the handle of a wooden spoon, or the edge of a butter knife, below the membrane on the back of each rack of ribs, and then use your fingers to grab it and pull it off. Season the ribs aggressively with salt and pepper. 4. 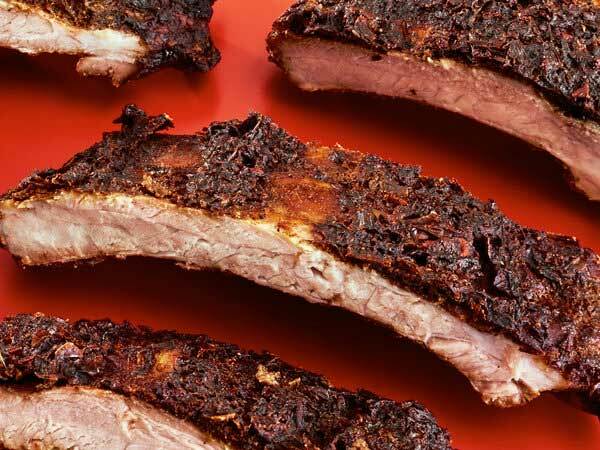 Place each rack of ribs on a large sheet of aluminum foil, and slather with the jerk marinade. Wrap the ribs tightly in the foil, and place on a sheet pan in the oven for 90 minutes. 5. Remove the sheet pan from the oven, carefully unwrap the ribs and anoint again with the jerk marinade. Return the ribs, uncovered, to the oven, and continue roasting for an additional 90 minutes, or until the meat is crusty and has just begun to pull back from the bone. Remove ribs from oven, allow to rest 5 minutes, then slice into individual ribs and serve on a warmed platter.